Spring book fair has always been the same week as chili dinner fundraiser and teacher appreciation dinner, but this is the first time I've worked book fair open to close every day and done the after-school events all together. As we were cleaning up after the dinner tonight (Preston Hollow Catering did a great dinner for us again), one of the moms gently teased me to remember to log my volunteer hours (there is apparently a friendly competition among schools in our district for that) and I showed her my visitor sticker timestamped at 7:38 AM today. We only exchange for credit and we only exchange once for "didn't like this" or "this book was too hard". I have read almost every book in stock and am happy to do a reference interview to help you determine whether you might like the book's subject or find it too challenging for pleasure reading before you buy it. If you want to exchange a book for pencils and plastic crap, I want a note or verbal acknowledgment from your adult that they are aware you are doing this. If you claim to have bought an item of negligible value with a large bill and not gotten change, you are welcome to leave a note with your name and homeroom teacher so we can talk with the vice-principal and the other volunteer that was in the room at the time you claimed this happened about it. You tried this last year with me and it didn't work then either. I call reorders in each day by 11 AM. They are delivered around noon the next day if they are in stock. If you want a book that is out of stock, you can pay for it in advance and it will be delivered to your classroom once it arrives. While you spent your entire lunch period circling the room complaining that the book is not in stock but you want to spend your money (and do not want to prepay for the book because you want something now), the friend you insisted stay with you kept repeating "my ice cream is gonna melt!" and I almost laughed while you were still in the room. I thought about texting about it to paradoxymoron, but texting makes my thumbs tired. Tomorrow should be quiet with busy periods at the beginning and end of the school day, maybe a steady trickle during lunch. Hopefully we will get a box of Spanish picture/early reader books since I requested one today (we usually get half a case of Spanish titles; this time we got ONE title in Spanish -- la octava Capitán Calzoncillos, the eighth Captain Underpants -- not at a reading level appropriate for the bilingual preschool class at our school) and a box of bargain books since the in-case special price titles are the same ones we got in the fall. We close Monday at noon and pack up the cases and boxes for pickup on Tuesday. Do not ask me if my feet are tired. I am too tired for that crap. Kids trying to scam at the book fair, I'm not feeling the love. Get lots of rest. I hope you're enjoying yourself. We have a couple of kids that try it every year. I've been doing it long enough to know what to watch out for. I am going to crash tonight once I have the kiddo in bed. Book fair = my favorite time of school. 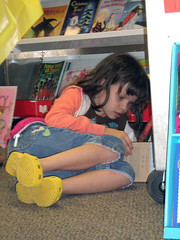 Laurel gets dismissed to book fair at the end of the day (rather than me going outside to get her) and after slinging her bag behind the cashier table, she pulls a book and sits down to read until we close up. is you nose tired from all that new book smellz? Nope. Every day when I open for the day, I stand in the middle of the room and just breathe it in. Texting makes my thumbs hurt, but that's because the damn hangnails.